He took us to the beaches of Goa in Khamoshi. And then to small town Saurashtra in Hum Dil De Chuke Sanam. Both were still close to ‘reality’. I will skip Devdas, the one aberration from SLB!! From Black to Saawariya and now to Guzaarish, Sanjay Leela Bhansali takes us beyond reality. To sets that have a sense of fantasy about them, to places which are imaginary in nature, and yet not quite Harry-Potteresque.. So although Guzaarish is supposed to be based in Goa, it is a Goa that most of us may not be familiar with – not the house, not the people and their dresses, not exactly the beaches-and-feni Goa! So it may as well have been some European country. But to me, this mystique about the location, is a part of the enigma of SLB. Harry Potter fans love the magic there, I love the magic of SLB’s vision, his fantasies, the mystical world he creates and shows us. So the first thing I love about the film are the awesome visual effects. The detailing in the house, the wooden floor, the wall with the various frames, the ceiling with the frames and the mirror, the poster bed, the chairs in the room, the radio station with the old style equipments… creates an impact. Also the few outdoor scenes – the time they get into the car and drive by the countryside. The visuals are captured beautifully. The subject matter itself, about euthanasia, generates enough debate and hence an interest in the treatment given to it. And all in all, it is a balanced treatment. For one who has been reduced to being a vegetable, the choice to die as much as he has the choice to live. Makes a lot of sense. SLB gets some good performances from the supporting actors. His old favorite, Shenaz Patel, delivers a spunky performance. We have a surprise in the form of Suhel Seth. While we have seen him dramatize his TV shows, it is pleasantly surprising to see him convert that drama to real acting, in his role of Hrithik’s doc. I have been disappointed by recent performances of Aishwarya. But back in the safe hands of SLB (after HDDCS), she comes up with a good performance, as the extremely devoted and dedicated nurse, serving Hrithik, for 12 long years! But that brings us to Hrithik. And the film is all about him. He is absolutely outstanding. Sad for all those actors who had good runs in films that came from January to November, 2010. Because they may have nursed ambitions of winning awards for the year. 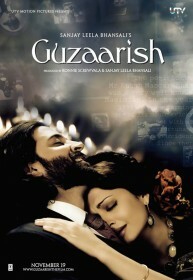 But late in the year, comes Guzaarish, and a Hrithik performance that is a class apart. Award-winning, stunning, masterful. He emotes brilliantly, just with his face. Happiness, sheer joy, laughter, anger, depression, tenacity, fight.. these are all conveyed through the eyes and the twitching of the muscles of the face. Now that is acting. And this is supported by some fabulous voice modulations while delivering the dialogs. He speaks in different tones, at different times. And which is part of his acting. When a dashing, action hero is rendered to ‘deliver’ his performance with just his face and his voice, all of that energy and skill comes to the fore. Brilliant may yet be an understated word to describe his performance! The few flashback scenes when he is shown to be performing his magic tricks on stage, only remind us of the amazing physical skills that he undoubtedly possesses, the flexibility of his body, the fantastic dancer that he is! And he sings too.. a skill discovered in this film. So as I said, other actors of this year, are only competing now for the second spot, in terms of the performance of the year!! And of course, the film is finally all about the director. And as mentioned at the outset, I am a HUGE fan of Sanjay Leela Bhansali’s. And he shows again, in this film, why I like his work so much. An absolute penchant for detail, striving for perfection, beautiful editing, getting excellent performances from his cast, all that makes him as good as he is. He conveys his vision beautifully. And this time, he composes the music too. And does a great job for a first time. We are aware that in all his films, he participates deeply into the music creation. This time, he removes the middleman!! And wields the music baton himself, and creates some magical tunes.